The Pennsylvania Nanofabrication Manufacturing Technology (NMT) Partnership is a joint effort between Penn State University and colleges and universities across the Commonwealth. The objective is to equip a new generation workforce with nanotechnology-based manufacturing and new product development skills. 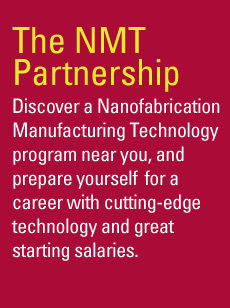 The NMT Partnership offers certificates, associate degrees, and baccalaureate degrees in Nanofabrication Manufacturing Technology (NMT). Currently there are 54 associate and baccalaureate degree programs available at 29 institutions across Pennsylvania. All academic programs require a Capstone Semester at Penn State University Park. This 18-credit semester is taught by staff from Penn State’s Center for Nanotechnology Education and Utilization (CNEU) and offers the most current hands-on exposure available in nanofabrication manufacturing technology. Physics, or Health Sciences may elect to also pursue a nanotechnology minor.